Proprietary blend of active cultures (contains a specific mixture of Lactobacillus acidophilus, Lactobacillus rhamnosus, Bifidobacteria longum, bifidobacteria breve. Chronic diarrhea, constipation, poor intestinal health, irritable bowel syndrome (IBS), colon cancer, inflammatory bowel disease (IBD), lactose intolerance. 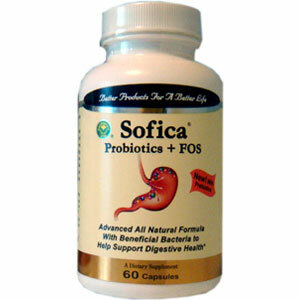 Sofica is the natural way to balance Micro flora and support intestinal function. Sofica, a high-tech scientifically proven dietary supplement contains a type of intestinal bacteria called Flora that is beneficial to your body. Intestinal Flora is useful in treating chronic diarrhea, regulating constipation and protecting the GI tract from unhealthy pathogenic bacteria. Proprietary blend of active cultures (contains a specific mixture of Lactobacillus acidophilus, Lactobacillus rhamnosus, Bifidobacteria longum, bifidobacteria breve. Other ingredients: Maltodextrin, calcium carbonate, cellulose, fructoligosaccharides (FOS), magnesium stearate, absorbic acid. Chronic diarrhea, constipation, poor intestinal health, irritable bowel syndrome (IBS), colon cancer, inflammatory bowel disease (IBD), lactose intolerance. Adults take 2-3 caps 2-3 times a day with warm water. How can you benefit from Sofica? Researchers are discovering more and more about how good bacteria may provide health benefits by altering the intestinal microflora and improving intestinal function. Though benefits vary depending on the type of bacteria used and the amount consumed, experts agree that daily consumption of those bacteria is most beneficial. Constipation is one of the most common gastrointestinal complaints in the United States, with about 3 million people reporting being affected frequently. Research has shown that regular daily consumption of Sofica may optimize the function of the gastrointestinal tract by shortening intestinal transit time, which improves regularity. Colon cancer is the second most common cause of cancer death in the United States. Though many risk factors have been studied, including genetics and environmental factors, many researchers believe that interactions between diet, the intestinal microflora and the cells in the lining of the colon are the key to what causes colon cancer to develop. Unfavorable changes in the intestinal microflora, sometimes caused by changes in the diet, may set the stage for the development of colon cancer. Regular, daily consumption of Sofica may help maintain a healthy intestinal microflora and promote a healthy environment. Another theory for the cause of colon cancer is that prolonged exposure to cancer-causing compounds in the colon may trigger the process. Although the research is not conclusive and more research is needed, Sofica may be beneficial for several major intestinal functions. Animal and laboratory studies have found that good bacteria may reduce the formation of cancer-causing compounds in colon cells and may actually bind to these compounds, rendering them less harmful. In addition, some animal studies have found that those bacteria reduce the potentially harmful precancerous changes caused by a high-fat diet. There are many causes of diarrhea, with bacterial and viral infections being among the most common. However, diarrhea often occurs when the intestinal microflora becomes unbalanced. This can happen temporarily, for example, when antibiotics are prescribed to fight an infection and “good” bacteria are destroyed along with the bad. Doctors suggested as far back as the early 20th century that live bacterial cultures, such as Sofica, might restore the microfloral balance in the intestines and offer benefits for diarrhea sufferers. More than 1 million people in the United States suffer from IBD, a painful and debilitating chronic inflammation of the digestive tract. The two most common forms of IBD are Crohn’s disease and ulcerative colitis. There is no cure. Studies have found higher than normal levels of “bad” bacteria in the intestinal tracts of people with IBD and there is growing evidence that the intestinal microflora plays an important role in the development of IBD. Therefore, taking Sofica can increase the good bacteria which fight back to bad bacteria. IBS involves a problem with how the muscles in the intestines work, coupled with heightened pain perception in the colon. It is typically characterized by gas, abdominal pain, and diarrhea or constipation, or both. Some studies have shown that an imbalance of “good” and “bad” bacteria in the intestine may be an important factor in the development of symptoms for some people with IBS. Sofica may help to restore the new balance. Your body has its own natural defense mechanisms against invading bacteria and viruses, collectively known as the immune system. While you may be familiar with some aspects of your body’s disease-fighting capabilities, you may be surprised to find out that about 70% of your body’s immune system is located in the digestive tract, where specialized cells play an incredibly important role as a first line of defense against invading bacteria. Research suggests that good bacteria may have a beneficial action on the intestinal microflora, the functioning of the intestinal lining and regulation of critical components of the immune system such as antibodies and natural killer cells. The microflora that occupies the lining of the intestinal tract also act a physical barrier. Regular taking Sofica helps regulate the level of friendly bacteria, reinforcing this barrier and maintaining intestinal health. Thirty million Americans are lactose intolerant, meaning their bodies don’t produce enough lactase, the enzyme needed to digest lactose, the natural sugar found in milk and other dairy products. Common symptoms of lactose intolerance include nausea, cramps, bloating, gas, and diarrhea, which may begin about 30 minutes to 2 hours after eating or drinking foods that contain lactose. Because of the good bacteria Sofica contains, it can help decrease the symptoms of lactose intolerance. When present as live and active bacterial cultures in Sofica, they reduce lactose content by “predigesting” some of the lactose, metabolizing it to lactic acid. The good bacteria in Sofica that survive the trip to the intestinal tract also provide additional lactase enzyme activity. Allergies, infections, reduction in blood cholesterol levels and control of high blood pressure are other areas that are also currently being investigated for the potential health benefits Sofica may offer. What are the good bacteria vs. bad bacteria? The complex ecosystem of bacteria that lives in your intestinal tract is called the intestinal microflora. You’re not born with this intestinal bacterial ecosystem in place. It begins to develop after birth and becomes more sophisticated once food is introduced. But the character of the intestinal microflora is not constant; the types and number of bacteria are influenced by several factors, including stress, antibiotics, illness, aging and your diet. Research suggests that when the intestinal microflora is out of balance (not enough friendly bacteria), it may affect your overall health. There are over 400 types of bacteria found in the gastrointestinal tract. You actually have about ten times the number of bacteria in your intestinal tract as you do cells in your entire body (about 100 trillion bacteria cells total). Most of these bacteria are not harmful; in fact, some are beneficial and are important for normal human growth and development. Some bacteria, however, can cause disease. Under normal circumstances, the “good” bacteria far outnumber the bad. Any shift in the balance of “good” or “friendly” to “bad” bacteria may affect how well your GI tract functions.